Situated in Northern India in the mountainous region of Himachal Pradesh, Kangra tea is the only tea in the world that’s entirely an organic tea. The valley where Kangra tea is grown is known as ‘the valley of the gods’ and is naturally devoid of pests and diseases that attack tea plants, meaning that no pesticides are needed to be used. Bordered by Punjab and Kashmir and with a diverse terrain with everything from pine covered slopes to the high altitude frozen foothills of the Himalayas, the Kangra valley is ideally situated and has almost perfect climate for growing tea, with temperatures ranging from 13-35°C year round and good rainfall, the Kangra valley produces some of the finest teas in the World. It was in the 1850’s when the British discovered this area and immediately started growing tea plants from Chinese seeds. Tea production in the area grew until 1905 when an earthquake struck the region. The British tea growers decided to leave the valley, which meant the native farmers were left to carry on with the tea production. Although mass production never returned to Kangra, the relatively small farming community pride themselves on the quality of the tea they produce. Tea production plays a vital role in the local economy and Kangra tea has become world renowned for its rich aroma and distinctive taste. 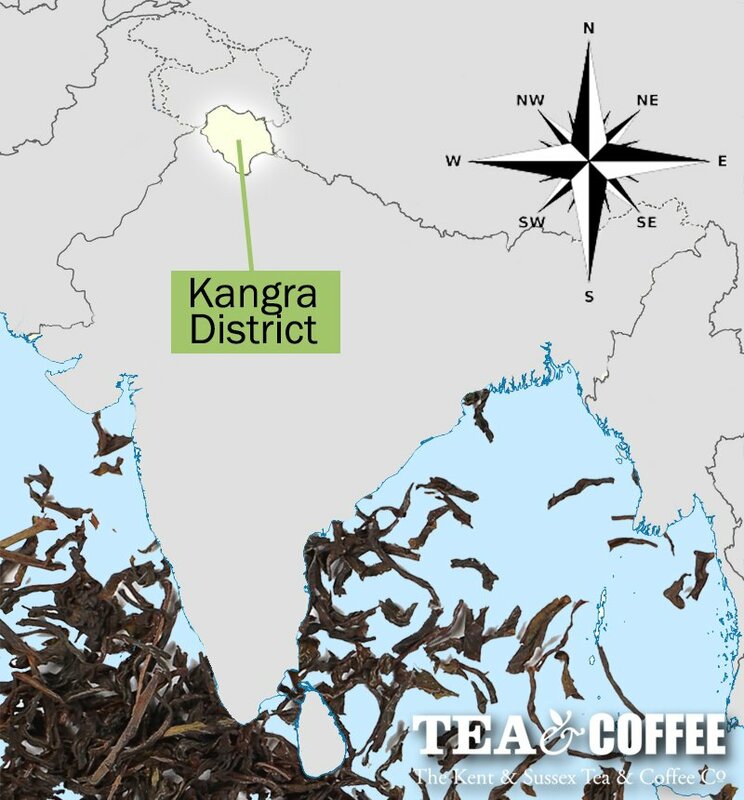 Often compared to Darjeeling tea, Kangra tea has a bright, amber liquor when brewed and a taste all of its own. 90% of tea produced in the Kangra region is black tea, the rest is made up of green tea and herbal tea. Tea from the Kangra valley is a new addition to the online store and as such we currently only offer Kangra Dharmsala Tea TGFOP1. This fine quality tea is a Tippy Golden Flowery Orange Pekoe 1 grade tea which has a delightful sweet flavour and aroma.